Peachtree Publishing Company, 9781561458844, 32pp. Grampa is looking after Ben's mischievous dog, Buster. Who will be top dog? Looking after Ben's dog, Buster, is no walk in the park. Buster is messy, he is naughty, he is EXHAUSTING But Ben loves him more than anything. When Ben goes away, he tells Grampa exactly how to look after Buster. But has Ben remembered the most IMPORTANT thing? 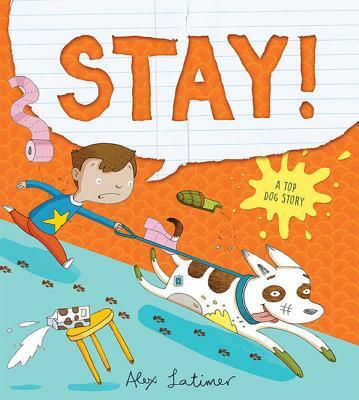 Stay is a quirky tale from Alex Latimer with strong visual storytelling and an entertaining message about the joys - and challenges - of taking care of a dog.